The simple answer to this question is yes, bleach does kill mold. Many people choose to use bleach in order to kill mold as a DIY alternative to hiring a professional. Interestingly enough some mold killing products actually contain some form of bleach. The question is, why would anyone need to worry about mold growth if bleach can take care of the problem with ease? This is where the general misconception is found. First off, bleach is not super effective at killing mold, in fact its effectiveness declines over time even in a sealed container. Second bleach is not a catch all solution for mold. In any case that there is mold growing on wood, drywall or any other porous material, the bleach will only kill the surface mold. One other major issue with using bleach to kill mold is that you may just be concealing the problem and not removing it. Due to bleach’s dying properties, the mold may become hidden and thus suspected as removed when in fact it is still there and causing damage. Furthermore DO NOT use bleach on wood. Bleach will affect the structural integrity of the material and can damage wood fibers which can cause other major issues down the line. I have a mold problem. Should I use bleach then? For most cases the answer is NO. If the problem is located on tile or a similar surface then it may work and properly kill all of the mold. However, there are definitely better and more reliable alternatives such as vinegar or of course a proper anti-microbial chemical(We definitely recommend a strong antimicrobial or fungicide over any other home remedy). If the mold is in your walls, on drywall, on wood, or anything else hard to reach or porous then bleach can be an extremely bad idea. First off, bleach evaporates leaving behind large amounts of water. Water paired up with the fact that the mold is tucked away within the material itself will result in a much more violent return of the mold problem which may be many times worse than the original infestation. If the mold infests any insulation or carpeting, then it may simply be time to replace it. Part of the process of mold remediation is removing the dead mold. This is not always possible in the case of something such as wall insulation or carpeting. It is also important to note that insurance can cover mold remediation, therefore it would likely be better to just hire a professional, especially for large fungal growths. When do I call in the professionals? If you have any sort of allergic reaction to mold or if it is causing any other health issues, then please do call a professional. Do not risk your health trying to clean the mold up as it may worsen your symptoms. If the mold is within your walls, carpeting and other difficult to deal with location then call a professional. If you can’t properly identify the type of mold and thus can’t use a chemical that you know will kill it then at least seek some professional guidance in the form of an inspection or mold testing. If you suspect that there may be more mold hidden in your property then get a professional inspection done (often times a visual inspection is free). A professional will be able remove all of the mold in the safest manner possible while also avoiding any damage to the property. When done properly this way, the mold will not return unless flooding or a leak occurs. Some mold removal services including the one we provide will not only remove the mold properly(without risk of spreading the spores) but we will also repair any areas that may have been damaged by the mold or removed by the technicians. It is possible to remove mold without professional assistance, however that does not mean you should cut corners. First off do yourself a favor and get a proper antimicrobial or fungicide that can kill the type of mold that you have. Second, find a proper guide to removing mold so that you do it properly and safely. Third, know your limits. If a mold problem is large, there is likely to be a considerable amount of damage and a rather large underlying problem. Call a professional and have them go through the hard work of killing, removing, repairing and taking care of anything that may have caused the problem in the first place. This will ensure that the problem does not come back and that you will be on your way headache free as soon as possible. 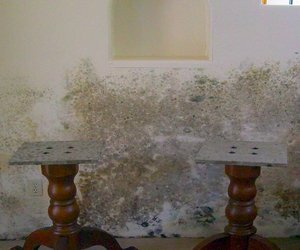 If you live in Tucson Arizona and you suspect that you might have mold growing in your property then give us a call (520)818-2591 or use the contact form! We can perform a free inspection (for the property owner) and can determine what needs to be done if we find any mold. We handle everything from insurance to mold removal to repairs.